Coronado is the latest city to discuss how to best address the potential impacts of rising waters. Areas of San Diego more vulnerable to flooding caused by storm surges, king tides. Silver Strand could be partially or fully submerged if mitigation steps are not taken. SOUTHERN CALIFORNIA — A lot can happen between your reading of this article and the year 2100. Of course you will not be around to witness how the world looks 84 years from now, but such realism is not stopping environmentalists, scientists and policymakers from trying to prevent those who are alive in the next century from losing coastal communities to sea level rise. In August 2015 the California Coastal Commission adopted a set of guidelines to address sea level rise through Local Coastal Programs and Coastal Development Permits. The Coastal Commission’s guidelines to address sea level rise was broken down into four categories: use science to guide decisions; minimize coastal hazards through planning and development standards; maximize protection of public access, recreation and sensitive coastal resources; and, maximize agency coordination and public participation. “There is strong evidence showing that the cost of doing nothing to prepare for the impacts of sea level rise exceeds the costs associated with adapting to them by about 4 to 10 times,” Coastal Commission staff stated in its sea level rise policy guidance. 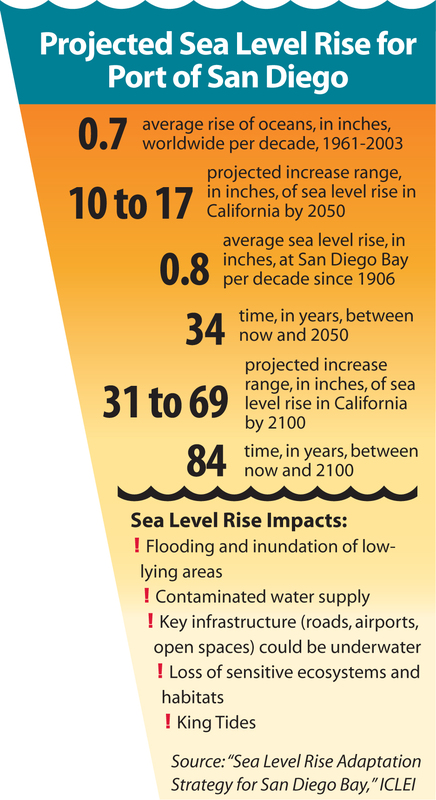 Coastal Commission staff added the global mean sea level has already increased by several inches in the past 100 years and the rising waters is likely to blame for climate change and higher water levels. The Coastal Commission adds more than 21 million people live in California’s 22 coastal counties and about $100 billion in property is at risk of flooding if the sea level rises more than 4 feet by 2100. Properties and locales at risk include residences, harbor infrastructure, power plants, commercial fisheries, wastewater treatment venues and Highway 1. Complementing the Coastal Commission’s sea level rise policy guidance document is a federal report, “Climate Change Impacts in the United States,” published by The U.S. National Climate Assessment in 2014. The report found temperatures across the United States were higher between 2001 and 2012 than any previous decade since 1901. The National Climate Assessment is a federal study mandated by the Global Change Research Act of 1990. More than 300 experts work with a 60-member federal committee to publish the report. “Over the past century, global average sea level has risen by about 8 inches. Since 1992, the rate of global sea level rise measured by satellites has been roughly twice the rate observed over the last century, providing evidence of acceleration,” the federal report stated. Accurately predicting just how much sea levels would rise within the next 100 years is “challenging,” according to the National Climate Assessment. However the 60-member committee stated even the most sophisticated prediction models would underestimate future sea level rise. “Recent projections show that for even the lowest emissions scenarios, thermal expansion of ocean waters and the melting of small mountain glaciers will result in 11 inches of sea level rise by 2100, even without any contribution from the ice sheets in Greenland and Antarctica,” the National Climate Assessment pointed out. “This suggests that about 1 foot of global sea level rise by 2100 is probably a realistic low end. On the high end, recent work suggests that 4 feet is plausible. “In the context of risk-based analysis, some decision makers may wish to use a wider range of scenarios, from 8 inches to 6.6 feet by 2100,” the federal report continued. While the Coastal Commission and federal government provide a broad overview of climate change local communities are also discussing strategies of how to address sea level rise. The Port of San Diego, in conjunction with International Council for Local Environmental Initiatives (ICLEI), published a sea level rise adaptation strategy document in 2012 and predicted some areas of San Diego Bay would become more vulnerable to flooding caused by storm surges and king tides. Port officials identified 10 strategies to address future sea level rise, such as regularly engaging with the public and ensuring upcoming capital projects include adaptive measures to withstand the predicted affects of rising waters and climate change. A discussion of how the San Diego area coastline could look like in 2100 dominated a recent Coronado City Council meeting. Coronado resident Ted Camaisa made a sea level rise presentation to the Coronado City Council on Sept. 6, hoping to spark a region-wide conversation of how to confront an issue most people alive today will never experience. 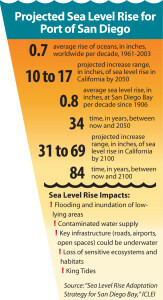 Many sea level rise predictions forecast the Pacific Ocean being 5 or 6 feet higher by 2100. The city of Coronado itself is vulnerable to potentially negative affects of sea level rise. A long, narrow stretch of road known as the Silver Strand, which bisects San Diego Bay and the Pacific Ocean between Coronado and Imperial Beach, could be partially or fully submerged if sea level rise is fully realized and mitigation steps are not taken. Coronado Cays, home to a yacht club and several recreational boating slips, calls the Silver Strand home. Camaisa, who is also a retired member of the U.S. Navy, acknowledged there is an ongoing debate of whether sea level rise is actually happening but added there is nothing wrong in being prepared for the worst. “No one knows for certain the impact climate change will have on sea level rise. I think the operative phrase we should use is, ‘plan for the worst and hope for the best,’” said Camaisa. He presented a line graph to commissioners predicting four possible scenarios of sea level rise by 2100: low (0.65 feet rise), intermediate-low (1.64 feet rise), intermediate-high (3.93 feet rise), and high (6.56 feet rise). Rising sea level is definitely happening, a climate change expert from Scripps Institution of Oceanography told the Coronado City Council. “It’s clear that sea level is going up. We’ve been seeing it historically,” Scripps’ climate researcher Dan Cayan, said, adding melting of the ice sheets have substantially contributed to rising sea levels. Cayan also pointed out sea levels will continue to rise beyond 2100. Councilmember Bill Sandke, who is also vice commodore of the Coronado Yacht Club, said public policy addressing climate change and sea level rise has been stagnant. What are some measures cities and states can take in addressing sea level rise? Camaisa suggested elevated developments, floating developments and managed retreats. Coronado will review sea level rise issues through a re-activated working group. The group would include public agency representatives from the San Diego region. Any policy addressing sea level rise in the San Diego area would involve the Port of San Diego, Scripps Institution of Oceanography and the Coastal Commission. Sea level rise has also been a major topic for discussion in Orange County, where Newport Beach hopes to develop a plan to prevent the city’s harbor area from succumbing to rising waters. The city hopes to rehabilitate its aging seawalls at Balboa Island, where sea level rise poses the greatest threat. Some of Balboa Island’s residents own boats and have private piers. Updating all of Balboa Island’s seawalls to protect local residents and boaters from sea level rise could cost the city $68 million, it was revealed during a Newport Beach City Council study session in 2015. City officials are also considering updating portions of the decaying seawalls, with estimated costs ranging from $14 million to $35 million. Balboa Island is the lowest landmass in Newport Bay; the island’s elevation is between 5 and 7 feet. The seawalls protecting the island were built more than 75 years ago and, according to city officials, have exceed their designated lifespan. How sea level rise would affect Marina del Rey, San Pedro, Long Beach and other coastal areas of Los Angeles County was at the heart of a recently published University of Southern California study. The USC Sea Grant report found Los Angeles could experience up to 2 feet of sea level rise by 2050 and almost 6 feet by 2100. “Low-lying San Pedro and Wilmington, communities around the Port of Los Angeles, are more vulnerable to the impacts of sea level rise, due to lower per capita income, lower education levels and linguistic isolation,” according to the USC Sea Grant report. San Pedro and Wilmington are home to thousands of recreational boaters. To address sea level rise in the Los Angeles region, USC Sea Grant suggested the city regularly assess its vulnerabilities as more accurate scientific information becomes available and continue an adaptive planning process. Meanwhile a climate action plan posted on Los Angeles Mayor Eric Garcetti’s website states the city hopes to address rising temperatures and waters by divesting entirely from coal-fired power plants and reducing greenhouse gas emissions by 80 percent of 1990 levels by 2050. In April 2015 the city of Carpinteria, which is located between Ventura and Santa Barbara, hosted a workshop to discuss planning strategies of and challenges to potential sea level rise off the Central California coast. The workshop was a collaborative effort involving officials from Carpinteria, Santa Barbara County, Ventura County, California Sea Grant and the California Coastal Conservancy. A research project is currently underway through the Frankel Environmental Law Program at UCLA School of Law to develop a model ordinance for local governments to use when trying to incorporate sea level rise adaption plans into existing land use plans. The constant theme in all sea level rise discussions: a lot can happen between now and 2100, but the best way to be prepared for the worst tomorrow is to make the best decisions possible today. There is no shortage of public agencies, local governments and regional non-profits to contact on this topic. In addition to the contacts below, others you can reach out to include your local city council, county supervisors or state legislators. Each government and public agency states public input is vital to how sea level rise policy is crafted. Please be sure your voice is heard. ← Is desalination the answer to our persistent drought problems? Of course sea levels will rise REGARDLESS OF WHAT MAN DOES. For the pea brains that think we can stop the continued decline of the ice age then I have a bridge to sell. The earth has gone through this many times. We need to continue to clean up after ourselves but no to the point that we impact the lives of the poor and the middleclass through phony carbon taxes that are seldom used for what the politicians have sold us on in order to use it to balance their out of control budgets.